Apart from the obvious benefits of cloud computing, such as controlling costs, being able to flexibly scale up and down based on need, quick startup and fewer maintenance requirements, there are of course specific points about Varnish Plus Cloud that are the most frequently asked questions we handle, which we’ve tried to visualize in a clear way. In this post, we have broken down the anatomy of the two Varnish Plus options and put everything into a table for ease of use and to “clear away the clouds” to help your organization determine what you need or want from Varnish to meet your specific needs. Please self-register for Support and Software update. Link to Support and Software update registration page, here. You pay for what you use. 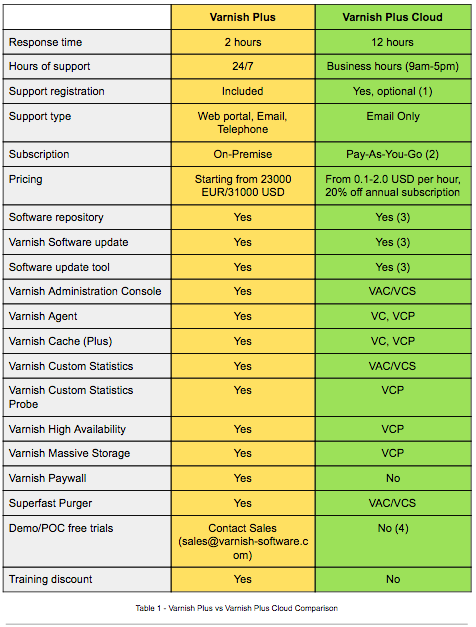 Software licensing fee to Varnish Software and infrastructure fee to Cloud provider. Ready to learn more or to try Varnish Plus for yourself? Sign up for a free trial or get in touch. If you have any inquiries, please do not hesitate to contact us at cloudteam@varnish-software.com.